What are the rules for withdrawing Roth IRA contributions? Does the timing of your withdrawals matter? What about the order? And what types of withdrawals can you make? That's a great question, because ignorance of the law can prove quite costly - usually in the form of income taxes and early withdrawal penalties. Let's learn more about the special rules and provisions governing your Roth IRA withdrawals. At first glance, withdrawing Roth IRA contributions doesn't seem complicated. But if you don't what you're doing, then you can unwittingly make several costly mistakes. This may not seem important. After all, money is money, right? What difference does it make what sequence the money is withdrawn? Believe it or not, it can make a whole lot of difference. For instance, let's say you're in a situation where you've withdrawn all of your original principal contributions. You still have a significant amount of funds in your account in the form of investment earnings, and according to the rules, you can withdraw your investment earnings tax-free. But what happens if you have rollover funds that aren't eligible for tax-free withdrawal? Let's say you're 63 years old with a $300,000 Roth IRA balance. Your account has been open for 15 years, and $200,000 of that balance is investent gains, while $100,000 is from a recent conversion you performed two years ago. You don't have any of your original principal contributions left in the account, because you've withdrawn them over the years. Because of the mandated sequence for Roth IRA withdrawals, you must withdraw any rollover or conversion funds before you withdraw your investment gains. And each conversion you perform is independently subject to the 5 year holding period, no matter how old your account is. Since you performed a Roth IRA conversion two years ago, those conversion funds are the next funds to be withdrawn. And since they haven't met the requirements of the 5 year rule yet, those funds are subject to income taxes and a 10% early withdrawal penalty! See now why it's really important to know the rules for withdrawing Roth IRA contributions? In some cases, withdrawing Roth IRA contributions early can cost you dearly in taxes and penalties. 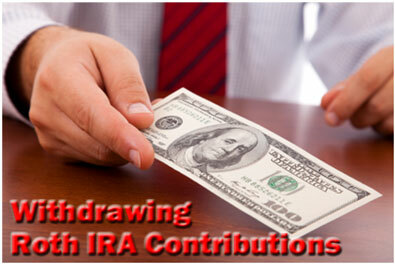 You can always withdraw your original Roth IRA contributions tax-free and penalty-free. But you need to be careful with the other funds in your account. Withdrawing them early can trigger income taxes as well as a 10% early withdrawal penalty. So how do you know if you're making an early withdrawal? Reaching age 59 ½ is self-explanatory, but how do you meet the requirements of the 5 year rule? Basically, the Roth IRA 5 year rule states that you must open and fund your Roth IRA for five tax years before you can make a qualified distribution. All other withdrawals are considered early withdrawals. For example, let's say you open and fund your Roth IRA in 2013 at age 58. At age 61, you're older than the required age of 59 ½, but you still haven't met the requirements of 5 year rule, so you can't make tax-free, penalty-free withdrawals. When can you make those withdrawals? 2018. Because by then, five tax years will have passed. 2013, 2014, 2015, 2016, and 2017. If you're withdrawing Roth IRA contributions, and you haven't met the requirements for a qualified distribution (age 59 ½ and the 5 year rule), then the type of withdrawal you make is very important. As previously stated, your original annual Roth IRA contributions are always available for tax-free, penalty-free withdrawal. For example, if you're 45 years old, and you've made $35,000 in annual contributions to your Roth IRA, you can withdraw $35,000 tax-free and penalty-free from your Roth IRA even though you haven't yet reached age 59 ½.
Non-original contributions, however, are a far different story. If you withdraw rollover funds, conversion funds, or investment gains prior to reaching age 59 ½ and meeting the Roth IRA 5 year waiting period, then you will probably owe income taxes as well as a 10% early withdrawal penalty. For example, let's build upon the previous scenario. You're 45 years old, and you just withdrew $35,000 in original contributions from your Roth IRA. You still have $45,000 in investment earnings in your account, and you're in the 35% income tax bracket. What happens if you withdraw them? Since you haven't reached age 59 ½, withdrawing Roth IRA contributions at this point will trigger income taxes and a 10% early withdrawal penalty since you've already withdrawn all your tax-free, penalty-free original contributions. In this case, if you withdraw $45,000, then you'll owe income taxes of $15,750 (35% of $45,000) as well as $4,500 from a 10% early withdrawal penalty. That's a grand total of $20,250 you paid just to get your hands on $24,750 a few years early! Do you see how it can be really expensive to make early withdrawing certain types of Roth IRA funds? With rare exceptions, almost all other withdrawals are subject to income taxes, an early withdrawal penalty, or both.